Long-term effects of exercise training are well studied. 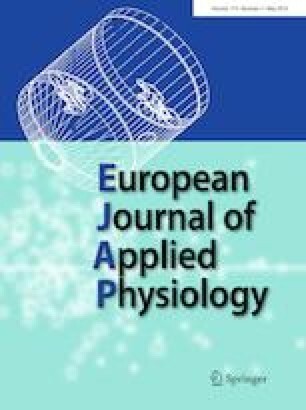 Acute hemodynamic responses to various training modalities, in particularly strength training (ST), have only been described in a few studies. This study examines the acute responses to ST, high-intensity interval training (HIIT) and moderate-intensity continuous training (MCT). Twelve young male subjects (age 23.4 ± 2.6 years; BMI 23.7 ± 1.5 kg/m2) performed an incremental exertion test and were randomized into HIIT (4 × 4-min intervals), MCT (continuous cycling) and ST (five body-weight exercises) which were matched for training duration. The cardiopulmonary (impedance cardiography, ergo-spirometry) and metabolic response were monitored. Similar peak blood lactate responses were observed after HIIT and ST (8.5 ± 2.6 and 8.1 ± 1.2 mmol/l, respectively; p = 0.83). The training impact time was 90.7 ± 8.5% for HIIT and 68.2 ± 8.5% for MCT (p < 0.0001). The mean cardiac output was significantly higher for HIIT compared to that of MCT and ST (23.2 ± 4.1 vs. 20.9 ± 2.9 vs. 12.9 ± 2.9 l/min, respectively; p < 0.0001). VO2max was twofold higher during HIIT compared to that observed during ST (2529 ± 310 vs. 1290 ± 156 ml; p = 0.0004). Among the components of ST, squats compared with push-ups resulted in different heart rate (111 ± 13.5 vs. 125 ± 15.7 bpm, respectively; p < 0.05) and stroke volume (125 ± 23.3 vs. 104 ± 19.8 ml, respectively; p < 0.05). Despite an equal training duration and a similar acute metabolic response, large differences with regard to the training impact time and the cardiopulmonary response give evident. HIIT and MCT, but less ST, induced a sufficient cardiopulmonary response, which is important for the preventive effects of training; however, large differences in intensity were apparent for ST. Communicated by Keith Phillip George. Roberto Falz and Sven Fikenzer contributed equally to this work. RF and SF conceived and designed research. RF and RH conducted experiments and analyzed the data. RF wrote the manuscript. SF designed and drafted and critically revised the manuscript. SF, RH, UL, KF and MB read, approved and critical revised the manuscript.